This week, Smashwords is having their Ebook Week full of lovely sales! You can grab each of my two novels for just $1.50, less than a plain ol’ cup of coffee at Starbucks (a small/tall! ), and a lot less than a frappacino. Just $1.50 for gripping psychological drama in the Victorian Era. Buy it on Smashwords for $1.50. Limited time only. Highly suspenseful Victorian Era fast-paced read for only $1.50. Grab it on Smashwords for $1.50. Limited time only. LOCKE AND KEYE Has A New Title! If you’re subscribed to my newsletter, then you knew about this days ago. If not, here’s the new title for Locke and Keye, my reasons for renaming it, and why the new title works better. You can also watch this video on my Facebook page! A couple of weekends ago, on both my Facebook profile and my YouTube channel, I talked about what I like to refer to as PC Penhale Syndrome. When you want to write, you’re inspired to write, you’re dying to write, and yet you just…can’t. It feels a bit like this Pablo Picasso quote, “If only we could pull out our brain and use only our eyes”, but for writers, we wish our fingers could do the typing and take out the brain that’s stopping us from moving forward. I was thrilled that fellow writers in the chat at my YouTube event understood my issue. Fellow writers on Facebook left wonderful messages of encouragement. All of that helped —and thank you! Have a look at the YouTube video below to see the helpful comments that popped up during the livestream. I want to let you know that writing every day helped a lot, and once I got going, I couldn’t stop! I think all that creative energy built up inside me came pouring out with fervor, so in that way it was great. But I don’t want to let it happen again because it’s painful until the spell is finally broken. Even if I don’t feel inspired or have the path yet for my “main” work (i.e. the next book in the Dark Victoriana Collection), I have SO many other planned works that it’s not hard to pick one and work on it instead. So I’ll have to make sure that I use my writing time for either my main work or one of those other projects. If you’re suffering from PC Penhale Writer’s Syndrome, watch the below video to know you’re not alone, and leave a comment so we sufferers can commiserate. Happy Monday! Win Signed Dark Victoriana Collection Paperbacks! Enter to win signed paperback copies of Anatomy of a Darkened Heart and Locke and Keye on Goodreads! One of each is available in their own giveaways below, and they both end January 24, 2018. Good luck! Giveaway ends January 24, 2018. Canadian Radio CJRU Book Interview September 27! On Wednesday, September 27 at 1:30 p.m. Eastern Time, listen to my interview on CJRU 1280 AM’s All My Books, a wonderful bookclub show hosted by Jacky Tuinstra Harrison. We’ll be talking all about Locke and Keye, including inspirations, how etiquette and respect for authority of the Victorian era play into the book, the mantra the locksmiths repeat, and so much more, plus a live reading! Win a Signed, Theme Gift-Wrapped, Personalized Paperback! You read that right! Win your paperback copy of Anatomy of a Darkened Heart signed by me, personalized, and specially gift-wrapped for you! Enter now through October 10, U.S. residents only. Giveaway ends October 10, 2017. LOCKE AND KEYE’s Release Day! The day has come! Locke and Keye is now available as the newest member of the Dark Victoriana Collection family. 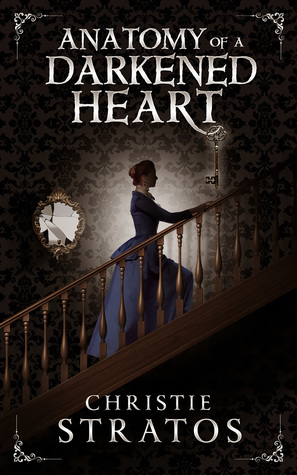 I can’t wait to hear what you think of this book, and remember – if you haven’t read Anatomy of a Darkened Heart, you can still read Locke and Keye as a standalone novel. If you want to hear more about the Dark Victoriana Collection, my journal collection and my future plans for my haikus, and lots more, author JD Estrada’s interview with me is ready for you to read!